Stuck in your daily duels between right and wrong, spending time and effort to prove that you are right and other person is not...even if this duel is only within your mind? It is frustrating you, hurting you, and it is draining off your energy..a lot of energy. I just drew a number on a plain white sheet of paper, and left it between the two kids. "Its a 6" remarked Avya, looking at the picture in front of her. "No, you are wrong Avya. Its a 9" remarked Disha, her sister - looking at the same picture. Well, it is just that Disha is standing on the other side of the same picture. "C'mon Disha. This is basic sense. It is clearly a 6." "Lets ask Dad. It is so stupid if you consider this as a 6 and not a 9." I was brought in to intervene. And you know the classic problem of 6 vs 9. Neither Avya nor Disha is wrong. Both are right from their own perspective. Then why are they debating? They are debating because they are doing the same fundamental mistake that all of us do everyday, day in and day out. They are disgusted with each other because they believe that "only one" of them can be right. What a erroneous belief system...that only one can be right. It is just so deep rooted in our minds that we feel that the "truth" and the "right" can only be one. And each of us feel that we understand the truth. It is so clear to us, and therefore, the other person has to be nothing but wrong, in his understanding. And we don't stop here with this belief. We go a few steps further. 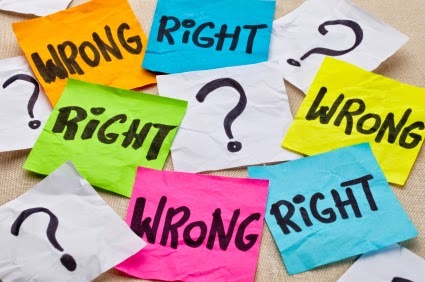 We take it as our moral responsibility to correct the other person, without caring what the other person feels, believes or whether he / she is even open for correction. There are as many truths in the world as the number of people. Tea is warm or cold or is it just the way it is. Warmth or Chillness is a feeling which can be different for different people. The government was right or wrong in their decision. Well, the decision is a decision. Whether it is right or wrong is as per you, which may be absolutely the reverse for the other person. A tax rebate may be good for the individual in the short term but may give less money to the government, hence bringing in less technology projects to make our lives easier, thus probably making things inefficient and costly for all of us in the long run. There is nothing right or wrong here. Everything is the way it is. Reaching the party in time, or 10 minutes here and there..Stop nagging at it. Neither is wrong. Discipline is important, but not at the cost of losing your happiness. For someone +/- 10 minutes may be the right definition of discipline. We cannot decide someone else's definition. The shot that the batsmen played because of which we lost the match, the behavior of the child, the resistance of your sister, the inclamant weather- and the list goes on and on. Nothing is wrong in anything. It is just the way it is. It is just the way it is supposed to be, and it is the way it is because of a specific reason, which we may or may not be aware. "Avya, Disha...there is nothing right or wrong here...The number is just the way curves have been drawn on the paper. You see it as 9 and she sees it as 6. Both of you are right." Avya goes to Disha's place and confirms what I just said. And then Disha does the same thing. "Darlings, the same holds true for anything and everything in life. When we don't accept what is presented to us, and try to oppose it to prove ourselves right and someone else as wrong, we lose our valuable energy in the ensuing resistance that we offer to the situation - the energy which we could have been so easily channelized in doing some other extraordinary work for ourselves and for others. Remember that all of us have limited time and that much energy. It is up to us how we want to use it efficiently and productively." "You are right Dad." said Avya. "Well, no one is ever wrong." remarked Disha. We all laughed and gave a high five. But a good lesson learnt is definitely the first step to implementation. The book Happiness Unlimited shows you many such lessons to lead a happier, contended life.